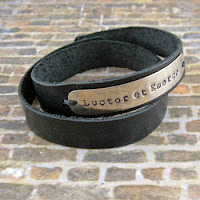 Oak City Gallery is proud to announce its release of several new designs of Latin Phrase Jewelry. Leather cuff bracelets, leather wrap bracelets and several new pendant designs which are now available just in time for holiday gift giving. Custom Latin Phrase bracelets are available as well; pick your saying then pick your bracelet style, we’ll make it for you. 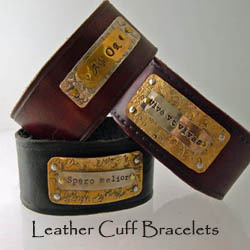 Browse the Leather Cuff and Leather Wrap bracelet gallery for several design ideas and leather strap colors or, take a look at some of the Inspirational Bracelets for ideas. If there’s a design or style you like, chances are I can reproduce it for you. Let me know what I can make especially for you or someone special. WILL MY BRASS JEWELRY TARNISH? Of course it will, don't let anyone tell you it won't. We can coat it with archival wax, car wax, along with tons of other agents that say it will prevent tarnish; only for a while. Let's face it, copper, brass, nickel, German silver, and sterling silver will eventually tarnish and if you live in a humid climate, your metal will tarnish much faster than normal. When it happens will depend on how you care for your jewelry. SHOULD I BUY BRASS JEWELRY? Sure, or course, why not? Are you scared of a little tarnish? Regardless of what you do, certain metals are prone to tarnish. These metals will require a bit of maintenance on your part if you want them to retain their original shine and brightness. If not, let the metal age gracefully to the color you adore. Maintenance? What kind of maintenance? To avoid tarnish you need to love your jewelry, you need to show it how much you care by giving it an occasional rub down, a massage with a clean soft cloth. A short quick cleaning with a rub-a-dub-dub. Keeping your metals dry, clean and occasionally buffed with a soft cloth will avoid tarnishing. If you're in a humid climate I highly recommend you maintain your jewelry by drying and cleaning often. You can read and learn more about maintaining your metal jewelry at Oak City Gallery in the Copper and Metal Jewelry Facts section. Thinking of a custom bullet jewelry piece? Maybe a bullet pendant or bullet necklace for someone special or maybe yourself? The holidays are approaching fast and will be here before we realize. Place your order as soon as possible to avoid the holiday rush and insure your custom bullet arrives in time. Be assured I’ll do everything possible to make your custom bullet jewelry what you asked for and arrives in plenty of time for gift giving. Custom bullet pendants make wonderful gifts. 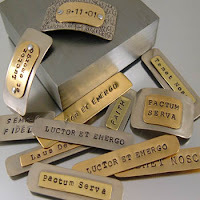 They can include a favorite design or color crystal, or maybe a date or initials or even a memorial bullet for keepsake. The possibilities are almost endless of what can be put onto a bullet casing necklace. Or you might consider a small bullet charm, or a bullet bracelet. If you have an idea for a custom bullet don't hesititate contacting me with your idea; lets make it a reality. How Safe is your Bullet Jewelry? You may read statements such as, “…the bullet casing is tumbled for several hours to ensure that no gunpowder residue remains…” Truth be told, the simply process of washing a dirty bullet casing after it’s been found will remove any gunpowder ‘residue’ as some call it. Normally if a bullet casing has been fired and lying on the ground for any period of time, the sand, dirt, wind, air, rain and natural elements have removed any remaining minuscule ‘residue’ if any, which may have remained after firing. After finding spent casings the first and foremost is to examine it to make sure it’s primer has been fired, and making sure the bullet is not live. Obviously no experienced bullet jewelry designer is going to use a live or dangerous bullet provided they know the difference! But do they know the difference? 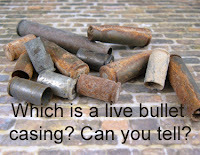 The scary part is not knowing if the person attempting to make a bullet pendant from spent bullet casings is experienced to know the difference between a live or fired bullet; if the primer is live, if the bullet head is lead, copper, jacketed or dangerous, was the bullet a misfire or is the bullet live in any way? Searching the internet you’ll find several instructional or informational sites explaining ways to make a bullet necklace; some work, others are downright dangerous. 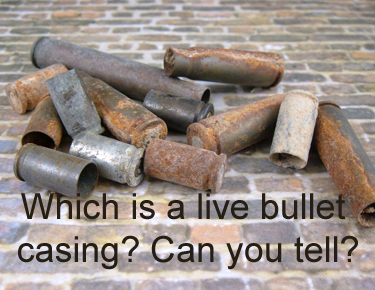 Some sites warn not to attempt working with a bullet unless you are familiar with live bullets, other instructions assume you are familiar with a live primer and bullet head where in fact you may know little if anything about a live bullet. I find myself writing numerous warnings to those attempting to create a bullet pendant. Drilling a hole into a live bullet can kill you, striking a blow to a live primer can inflect major damage to your body parts. When purchasing any bullet jewelry make sure you read everything possible about its creator; how long have they been making bullet jewelry, where does their experience come from? Don’t be afraid to ask the designer questions. Simply stating they rinse, wash or tumble bullet casings once, twice or several times doesn’t assure the casing is safe to wear. Finding bullet casings on the ground or buying spent casings doesn’t make you an expert on bullet jewelry. Has the creator every held a handgun or shot a rifle? Does the maker know the difference in calibers? Do they know anything about shooting; can they carry on a conversation about bullet sizes, head markings, or bullets in general? If a customer calls and asks if a memorial bullet casing can be designed will the jewelry maker know which size casing the customer is referring to or generally used at military, armed forces, or law enforcement funerals? Maybe this doesn’t matter to you, but it should. Anyone knowledgeable in the handling of firearms will know if a bullet, bullet casing/shell is safe. Make sure the person you are purchasing bullet jewelry from knows what they are talking about. Making a statement their bullet casings have been tumbled or washed several hours doesn’t mean squat if the casing has a live primer. Ask the maker about their personal experience with firearms and bullets, make sure they know what they are talking about and not someone who has jumped into making bullet jewelry for profit without knowledge or safety. Feel free to ask me whatever questions you have about bullet casings and the making of bullet jewelry. I’ll use the experience I have in fire arms to answer your question. If I don’t know the answer I will provide whatever resource information I have in order to help you feel confident and to answer your question. 2006-2018. Simple theme. Powered by Blogger.